Geographical Coordinates: Latitude 45º 8' 59"
Backa Palanka is a city and municipality located in Serbia, on the left bank of the Danube. 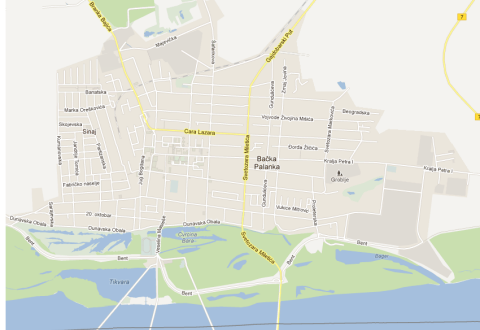 In 2011 the city had a total population of 27,924, while Backa Palanka municipality had 55,361 people. 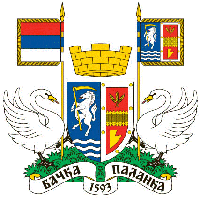 The Backa Palanka Coat of Arms. In the 11th century, this area was populated by Hungarians and Serbs. Backa Palanka is first mentioned as a settlement in 1486, as a suburb of Ilok called Ilocka. Until the 16th century, this area was administered by the Kingdom of Hungary. In the beginning of the 16th century, village was in property of landowner Laurence of Ilok, a duke of Syrmia. It was destroyed by the Ottomans after The Battle of Mohács in 1526, but was then rebuilt as a small Ottoman fortress named Palanka. During the Ottoman administration (16th-17th century), Palanka was mostly populated by ethnic Serbs. In 1687 Palanka was included into Habsburg Monarchy and more Orthodox Serbs settled there. Palanka was then mentioned as a small town of 167 houses, all of them Serb (1720 census data). Later, Germans, Slovaks and Hungarians settled there as well. It was part of the Habsburg Military Frontier from 1702 to 1744. Nova Palanka (New Palanka) was founded between 1765 and 1770, 2 kilometers away from original Palanka (which then became known as Stara Palanka - Old Palanka) and Nemacka Palanka (German Palanka) was founded by Danube Germans in 1783. 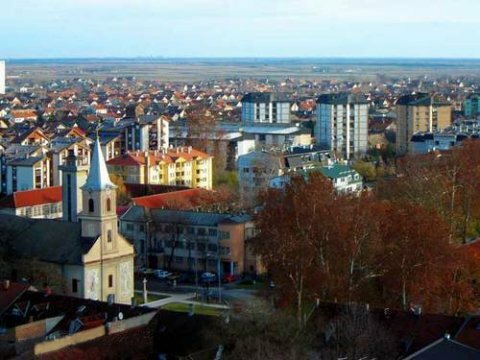 Eventually the three towns became one city, Backa Palanka, in the 20th century. In the second half of the 19th century, German population became more numerous than Serbian. According to the 1910 census, the population of Stara Palanka was mostly Serb, while populations of Nova Palanka and Nemacka Palanka were mostly German. The city was under Habsburg administration until 1918, when it became part of the Kingdom of Serbs, Croats and Slovenes (later renamed to Yugoslavia). During World War II (from 1941 to 1944), it was under Axis occupation. In 1944, one part of Backa Palanka citizens of German ethnicity left from the city, together with defeated German army. As a consequence of the war, the site of a post-World War II work camp for the remaining ethnic Germans (Donauschwaben) was formed there under a new communist administration. After the work camps were dissolved (in 1948), the remaining German population left Yugoslavia because of economic reasons. 3,609 (mostly Serb) colonists settled in the town after World War II, and most of them originated from Bosnia and Herzegovina. During 1990s, about 5,000 refugees from Croatia and Bosnia moved to Backa Palanka because of the Yugoslav wars. During the NATO bombing in 1999, Backa Palanka was bombed by NATO twice, and both times the target was The Bridge of Youth. It was only damaged, but not destroyed.